For Thanksgiving we went on a road trip to Big Bear. We had been there once before when we were only five months old, with our Grandma. This time we remember a little bit more. We saw our Aunt Karen, Double Pops and Val. We played outside a lot, and guess what? There were trees! Real trees with leaves and some with goofy needles. 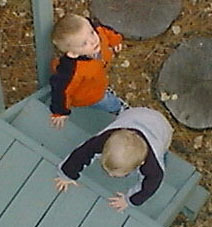 Here we are outside, Nicholas is on the left and I am on the right.